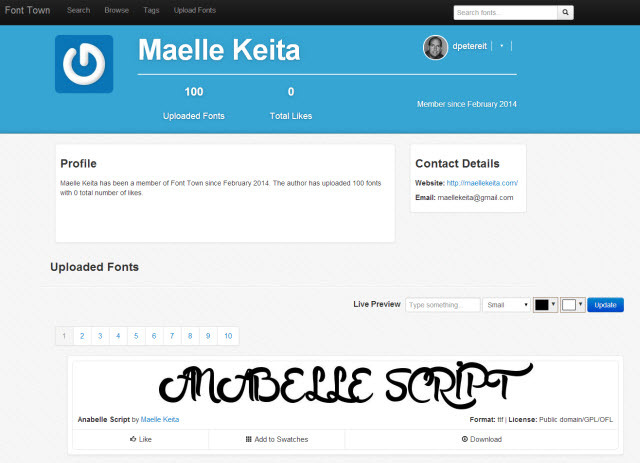 Australia-based Font Town is not exactly a brand-new service. In the game since 2009, Font Town has recently created ripples . This is mainly due to the service enhancements implemented as well as the rapid growth to over 30,000 fonts and the redesign of their UI. All the fonts hosted are free downloads and the user experience can well be called intuitive, while the actual use of the fonts is not always that straightforward. We have taken a closer look at Font Town and checked whether this is the new world capitol of free fonts. Visiting Font Town for the first time will not leave you awestruck. The overall design of the site is not what we would call state of the art. Mobile clients do love the simple layout, though. Navigating Font Town from your smart-phone is working flawlessly. If you are like me, you will very rarely feel the need to download a font while you’re on mobile, but might like to enter the planning process while walking the forest. That’s when good mobile performance comes in handy. Since its start in 2009, Font Town has grown to host more than 30,000 fonts. I guess this is mainly due to the fact, that font creators are enabled to upload their fonts by themselves. Curating all these fonts by a small team would not have led to a portfolio that big so fast. As Font Town tells me, their service is the biggest of its kind throughout the depths and widths of the world wide web. Having each and every font creator upload their fonts directly is not only a story of advantages, though. Besides the effect of a rapid growth, which is definitely the big upside to letting everybody upload individually, there is a downside that we cannot deny. Taking care of proper licensing is not without efforts. On the contrary you’ll have to check and double-check to avoid problems. Font Town secures itself even further by claiming that they do not necessarily know the correct license. Thus, even the license information on each font’s detail page is nonbinding and can potentially be unreliable. Instead of relying on these infos, Font Town advises you to check the font creators’ profile pages or, if you cannot obtain proper license information from there, the authors’ websites directly. At first look, I found this approach unsympathetic, to say the least. I don’t like to walk on thin ice. As I took a deeper look into what Font Town has to offer and how they do it, I got convinced otherwise. Look at it from a different angle and you can as well claim that is better to declare potential problems clearly than too vaguely. The reality check around Font Town proves, that most authors actually provide very clear license information, which anyone can abide by without unacceptable restrictions. Exceptions prove the rule. As in any big city there are also citizens of Font Town, who impose vague restrictions on the use of their works. I found one who does not allow the use of his font in project with a topical relation to television. This is hard to comprehend. I chose to keep my fingers of his fonts altogether. Downloading a font is completely uncomplicated. On various places you’ll find an unobfuscated download link. Clicking it starts the download without further ado and stores a zip archive to your local hard drive. The zip archive contains all available formats and variants of the chosen font. To simplify the handling of a larger number of fonts to download, Font Town introduced the concept of the so-called Swatches. This is similar to a shopping cart, basket or light-box as in stock photo services, where you cache the chosen fonts with one single click. After a more or less lengthy foray through Font Town, all the chosen fonts are accessible through the swatches list from where you can download them individually. The team tells me, that a feature to let you download all cached fonts from the swatches in one single go is already in the works and will be available in the near future. From Swatches you can easily remove fonts the same way you put them in. Clicking "Clear" empties the whole Swatches cache. If you don’t clear, you needn’t worry. It will be empty next time you visit anyway. If you want to keep your Swatches, you can always do so by registering for a free account. This is only mandatory if you want to upload fonts and/or comment on existing ones. But if you do anyway, your Swatches will keep their content. 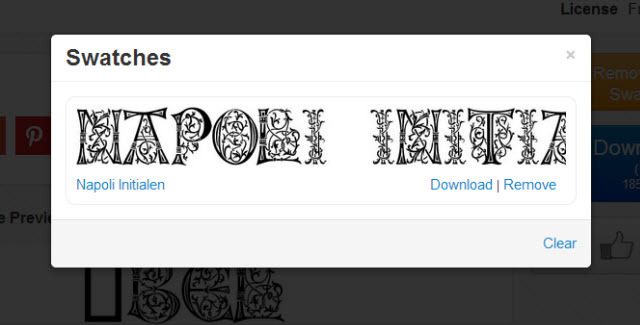 Uploading fonts does not automatically make them available to the public. There is an editorial process, each font needs to run through. That way, the chance for copyright infringement and masses of poor quality fonts gets reduced. With over 30,000 fonts contained, a thorough organization of the repository is crucial to allow for easy searching and finding. 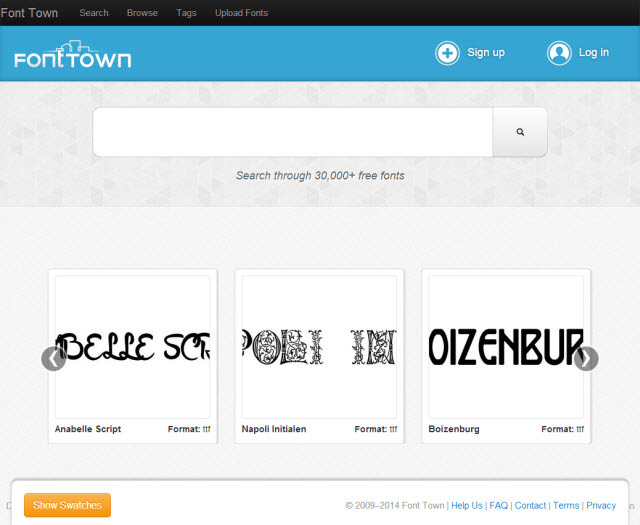 Font Town takes care of that and offers several ways to find the desired font. First we have categories and subcategories. Besides the obvious there is a category named Foreignwith subcategories for the most exotic (from my point of view) languages such as Japanese or Arabic. So, if you’re looking for these, you won’t have a hard time finding. 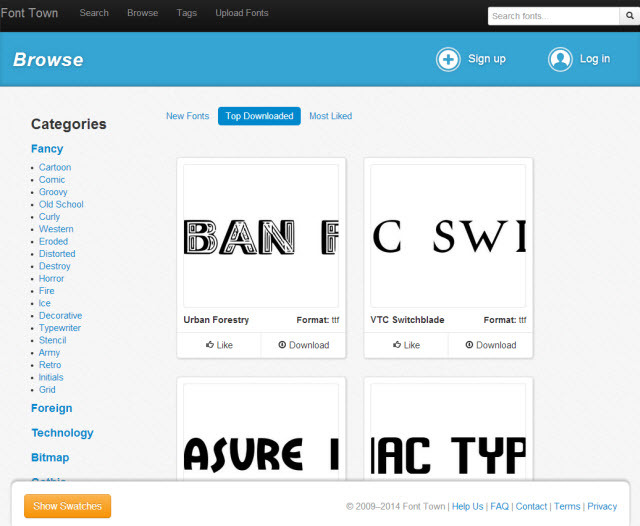 If you’re more the Web 2.0 type, who likes tags and their clouds, Font Town is there for you. Searching for tags is a valid alternative to the category search. If you like to swim in the main stream, you’ll be glad to know that also on Font Town there’s no getting round the omnipresent Top Downloaded and Most Liked. 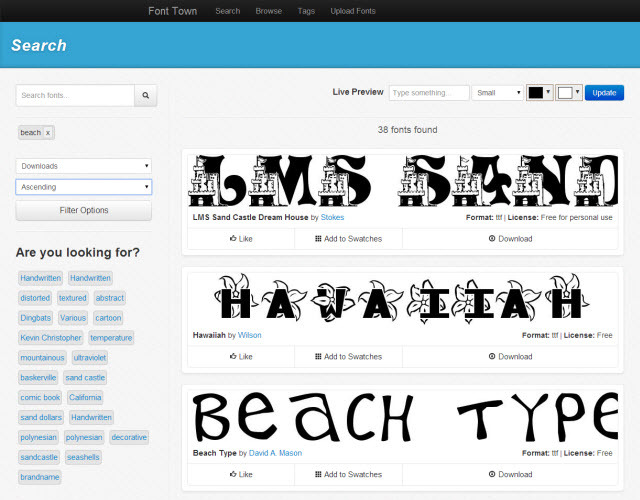 If you’re an avid user of Font Town, you’ll most likely be most interested in New Fonts. The search results can be refined further by tweaking several parameters. 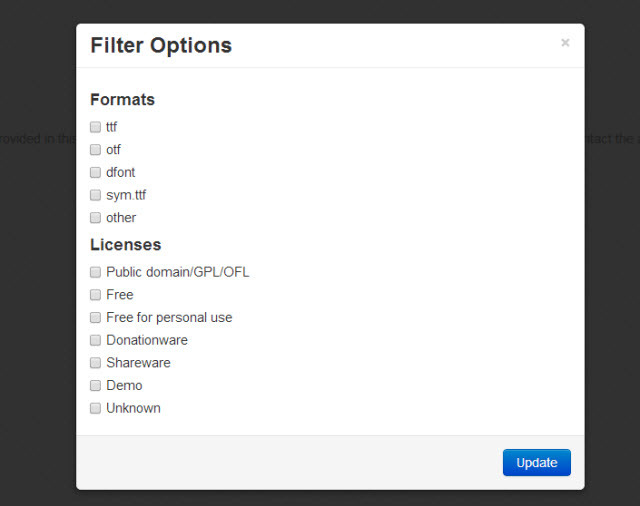 You could explicitly search for a specific license or a file format. Remembering what I said in regard to license information, this is not completely satisfying, but still helps separating the chaff from the wheat. Font Town: Is the Special Character Needed even Included? Unfortunately, determining the range of a given font is not a matter of casting a glance. Does a given font contain special characters and if so, which ones? Not containing special characters is a disqualifier in a quite a few languages, e.g. German. To make sure, a chosen font contains your needed special characters, you can go two ways. 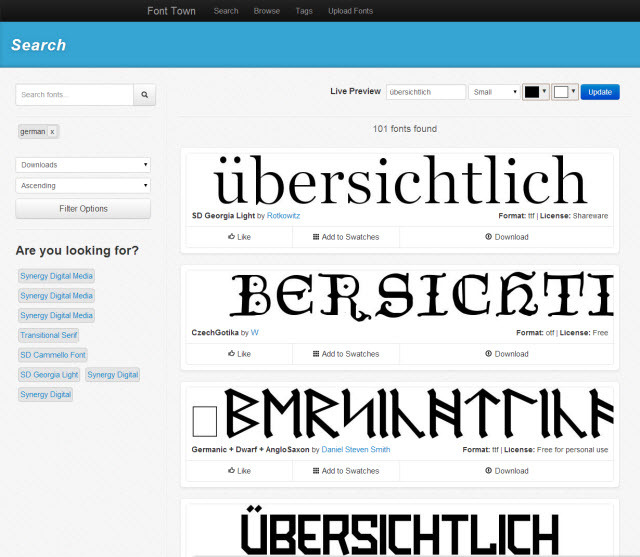 From the detail page of a font, enter a word with special characters into the form called "Live Preview" and click "Update". Your entered word will be displayed, using the chosen font. Also from the detail page check the contained glyphs. All in all there is not a lot to put against Font Town. What I really like, is the unobfuscated download. I’m sure you all know services who show you half a dozen download links on one single item page with only one really doing what you’d expect to and the other leading you to advertisers for whatever goods they offer. More often than not, the "real" download link is the hardest to find among the other alternatives. 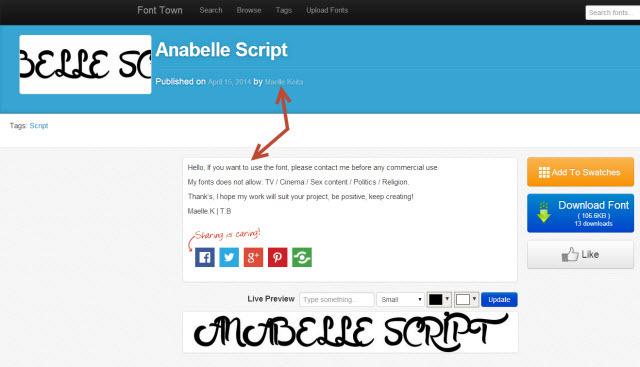 So, each time you go looking for fonts for your next print project, make sure you visit Font Town, too. Hey I am a font lover. I want them each day in designing new sites for my clients. This is an excellent help for me and my team in web designing.